A generation ago, aviation was seen as bulwark of unionized middle-class jobs in the modern global service economy. On October 2, a global movement for airport workers took flight at the world’s largest transit hubs, from Seattle to Sydney. Workers who keep airports running every day demanded a fair share of the the aviation industry’s soaring profits, including a living wage, improved safety standards, and union rights. Backed by an international coalition of about a dozen unions, the multicity demonstrations, which collectively disrupted an estimated 36 percent of global aviation traffic, showed the impacts of the industry’s massive consolidation and commercial deregulation since the 1970s—a steady downward spiral of labor standards and wages. According to Economic Roundtable, currently “Over 46,000 US airport workers and their families live below the poverty threshold,” and they collectively absorb an estimated $1.2 billion in public benefits, including food stamps and Medicaid. Airline-industry profits, meanwhile, have soared—from $10.7 billion in 2013 to $38 billion in 2017. Annual executive salaries are ballooning to hundreds of times more than frontline-worker wages, according to an analysis published by a coalition of airport unions. And airport contractors and carriers have fought fiercely to keep unions out. In the case of United Airlines, organizers recently uncovered a massive anti-union campaign that blanketed United’s kitchen workers with anti-labor propaganda and mass surveillance to intimidate and cajole workers into rejecting unionization. A generation ago, aviation was seen as bulwark of unionized middle-class jobs in the modern global service economy. Over time, multinationals have consolidated their power and spun off frontline staff to outsourcing firms that typically downgrade wages and impose exploitative workloads and schedules—while charging passengers more and more for worsening service. A 2012 study on New York City–area airport workers found that subcontracted workers were typically paid just $8 an hour—amounting to well under half of the estimated living wage for the region. About four in 10 workers reported they had trouble paying for housing each month, and one in five struggled to feed their households. But some workers are facing a brighter economic horizon today, thanks to a multiyear battle to uionize service workers across all the region’s major airports. After intense negotiations with the Port Authority, SEIU just inked a new contract that puts 40,000 workers on track to raise their hourly wages to from $13 to $19 in five years—some of the highest starting wages in the industry—along with improved safety protections and fairer scheduling rules. 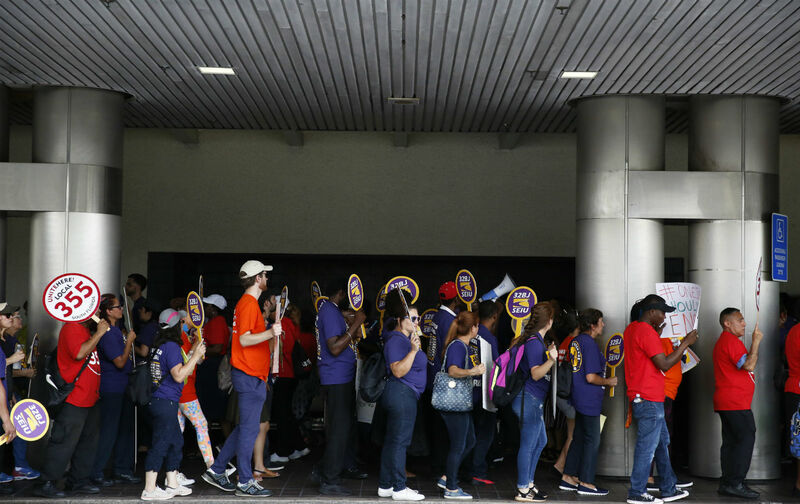 SEIU, along with UNITE HERE, have also rallied massive public support for stronger regional wage standards for airport workers, including successful efforts to boost minimum-wage rates for airport contract workers in Chicago, Seattle, San Francisco, and other cities. Raising the minimum wage for all airport workers in the country to $15, according to Economic Roundtable, would put an extra $1.8 billion in workers’ pockets immediately, while in the long-term, indirectly support about 25,000 local jobs with nearly $10 billion in added local sales through the year 2021. At Miami International Airport, Carlos Caballero an airport restaurant worker with UNITE HERE, talked about how workers struggling to feed their families were reaching a breaking point. The same demands echoed at airports abroad where other unions joined the day of action. At Toronto Pearson Airport, where the Teamsters staged an 80-day strike by Swissport ground crew workers last year, the Toronto Airport Workers Council has brought together multiple unions to negotiate with management and the airport authority on comprehensively revising workplace-safety standards. In Indonesia and South Korea unions have been organizing cabin crew together with ground-based workers to build unity across multiple sectors, to fight for decent wages and humane workloads across the value chain. Shoeb Babu, a wheelchair attendant, faces hazardous pressures at work every day as he transports the most vulnerable passengers through the crowds at Denver airport—sometimes pushing travelers who weigh several hundred pounds. If he ever got injured on the job, he worries the medical costs could crush him. Struggling to keep pace with the city’s exploding cost of living, he’s already juggling three jobs—racing day to day from the airport to a pizza delivery route, and then Uber rides and courier deliveries in his “spare” hours. Though he and his coworkers don’t have a union, he joined the protests this week to demand at least a wage that lets him live on just one job. Shuttling from one low-wage gig to another, Babu says, “really I don’t have enough time for even myself. So if I have better wages, I don’t need to work three jobs all day long, so I can have my life, a regular life…. We deserve more.” As a Bangladeshi asylum seeker who traversed the globe to seek refuge at the US border, Babu is relieved to finally be settling down in the Mile High City to rebuild his life. But at work, he’s still on the march, to stop aviation’s global race to the bottom.